This post contains affiliate links. As an Amazon Associate, I earn a small commission on qualifying purchases you make via links on this site, at no additional cost to you. My guided reading lessons used to be a HOT MESS. I knew how to use literacy centres to give the rest of my students meaningful time to independently practice the skills that I had previously taught. I had grouped my students more or less based on what they needed to learn. And I had a nice little table to bring them all to. A nice little table where we would all sit together and they would stare at me expectantly, waiting for me to teach them to read. "How the heck do you teach someone to read??" Honestly, I never really learned that in university. And my practicums were all with students who already knew how to read (grades two, three, and four). I had no idea how to start teaching someone to read, from the very beginning, when they know pretty much nothing! Luckily, I discovered Pinterest and teacher blogs and it was like a whole world opened up to me. I could learn about what other teachers were doing (mostly in English), try and find a way to make it work en français, and build a routine and lesson plans that were inspired by someone who knew what they were doing, rather than being pulled out of what felt like thin air. And if you teach maternelle, I am sure you are familiar with the wonderful beauty that is routine. A guided reading routine helps me and it helps my students. When we all know what is coming next, we are more efficient and we can get a lot more done. We don't have an abundance of time for our guided reading lessons, but we have a lot of skills to learn and practice, so this efficiency is crucial for my students' success. Explaining our entire routine in one blog post would be way too much, but today I would like to talk about the beginning of our guided reading lessons - our warm up. I will come back in future posts to talk about other pieces of our guided reading routine puzzle. Just like when you play a sport and need to warm up your muscles, our students need to warm up their brains before diving into the huge work that is guided reading. To help my students warm up, I like to do a quick game that targets a pre-reading or reading skill they need to work on. We may play a game to work on breaking sentences into words, words into syllables, or syllables into sounds. We may work on rhyming, or we may play a game that helps us practice sight words. Or, we may play a game that helps us with our 1:1 correspondence, or one of our animal reading strategies. Some of the games we play do involve some prep ahead of time, but today I want to share some warm-up games that you can play with your students that don't require any prep ahead of time. Even though they require no prep ahead of time, these activities will still help you work on four key pre-reading skills. One important pre-reading skill that our students need to master is the ability to take a sentence and break it into individual words. Our students should be able to hear a sentence, hold it in their minds, repeat it back, and figure out how many words there are. This can be tricky, because some students may want to take multi-syllable words and say that they are more than one word. For example, a student may think that the word "regarde" is actually two words - "re" and "garde". This can be problematic when they learn to read because it can throw off their 1:1 correspondence. To practice this skill, I give each student in my group seven "jetons" (any kind of counter would work). I say a sentence, and they repeat it back, placing one jeton on the table for each word. I vary the sentence length, and we work up to sentences with up to seven words in them. I try to use their names and their friends' names as much as possible, and I try to make the sentences about things that they are interested in. Possible variations on this activity would be to have them jump for each word in the sentence, or use seasonal counters (mini erasers, anyone?!). You could prepare sentences ahead of time, but I usually just make them up on the spot! You can read all about why we need our students to become pros at segmenting words into syllables in this blog post. In a nutshell, being syllable masters allows our students to both read and write new words more precisely and more fluently. You can practice this skill without having to do any prep ahead of time. You can use jetons for segmenting words into syllables just like you do with sentences above, but I like to keep the jetons for sentence segmenting and do other things for syllables. I just find that my students can easily get confused about which one I am asking them to do if we use the same manipulates! Clapping is a very popular way to practice syllables, but you can also have your students hum, jump, tap, snap, or do just about any kind of movement. Again, you will want to start with their names, their friends' names, and other words that are important to the students you are working with. If you have flashcards already in your classroom, you can also flash them and have your students segment those words. This is a great way to sneak in some extra vocabulary practice as well! If you need some more tips and ideas for teaching syllables, be sure to check out my FREE French Guide for Teaching Syllables. It is a 12-page pdf guide full of ideas for making sure your students get all the practice they need, AND it includes a print-and-go game for you to use as a guided reading warm up! Just CLICK HERE or enter your info into the box below and I will email it to you! Want to know more about syllables? 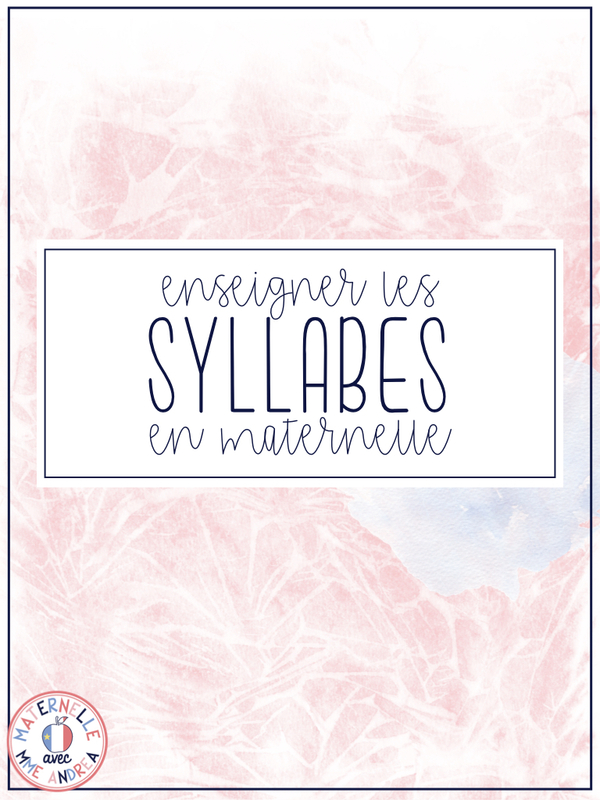 Sign up to receive a FREE French Syllables Guide to get you started on making sure your students master syllables! This skill is another essential one for our pre-readers because the better they are able to hear and manipulate individual sounds in words, the better readers they will become. In order to decode a new word, you need to be able to isolate each sound while you are sounding out, and then smoosh the sounds back together to form the word. Often, students will slowly say each sound as they decode, but then never actually put the sounds back together - they will just move onto the next word. That's why it is super important that every time you get your students to segment the sounds in a word, you also make sure that they "fusionne" the sounds back together! 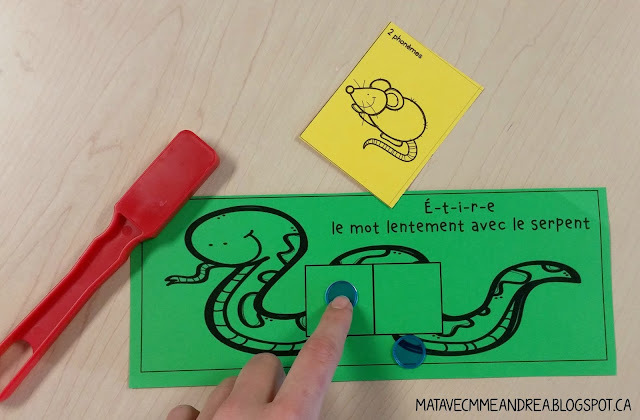 I do find this skill easiest to practice with sound boxes, which do take a tiny amount of prep 😉 I have some in my Lecture guidée en maternelle pack on TPT, but you could easily just draw them on a cue card or make some using the Table function in PowerPoint and print them out. No snake image required! You can also make some out of washi tape stuck to a clipboard or a whiteboard. To start, place one bingo counter under each box, for each student. You say a word with the target number of sounds, and your students will repeat the word s-l-o-w-l-y, dragging out and isolating each sound. When they identify each sound, they slide a jeton up and into a box, moving from left to right. Once they complete the word, don't forget to have them put the sounds back together! I love using magnetic bingo counters and wands for this, because after my students slide the counters up into the boxes, they can use the magnetic wand, moving from left to right, to pick up the counters as they say the word. It's a bit tricky to explain, but with the word rat, my students would say "rrrrr... (slide one counter up into the box)... aaaaaa.... (slide the other counter up into the box)... rat! (use the magnetic wand to pick up the counters from left to right). - Here is a combo pack with both - it's not exactly what I have (the ones I have are linked above), but it does look to be more cost effective! There are a few other games and activities that I use for "la fusion des sons", which you can check out in this blog post. Rhymes are also important to learn and understand. The more students can play with and manipulate sounds in words, the better readers they will be! We may think that rhyming is easy for children, but it isn't always. Many students need to be explicitly taught that two words only rhyme when the ends of the words are the same - not the beginnings. For example, students will often say that "tente" and "taco" rhyme because they both begin with Tt - but that is not the case! Students have a blast rhyming things with their names and/or their classmates' names. These rhymes may be real words or nonsense words - all that matters is that they are able to switch out the beginning sound, but keep the end sound the same. You can also say pairs of words (rat/chat, train/toupie, bateau/chateau, etc.) and ask your students to show thumbs up if they rhyme, or thumbs down if they don't. You could also say one word at a time and ask your students to produce a rhyming word, or a non-rhyming word. 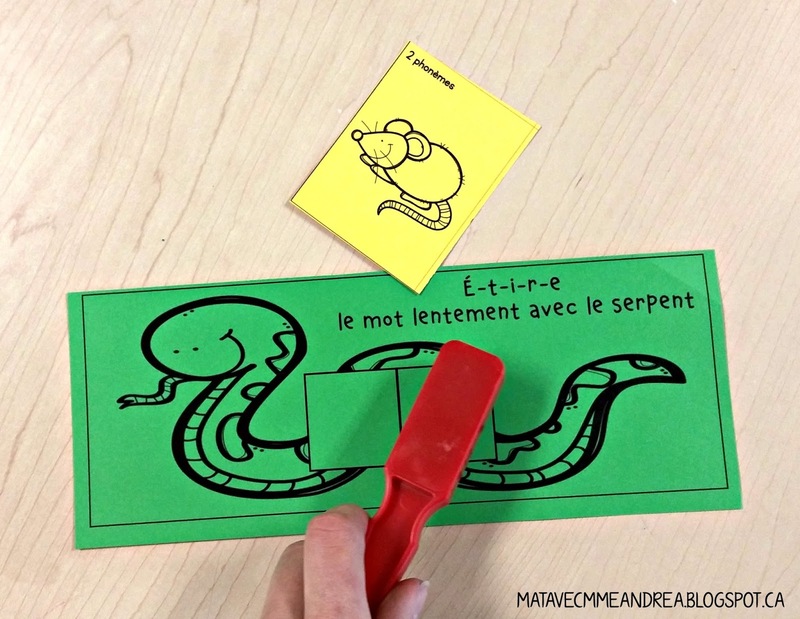 I actually have a blog post all about rhyming in maternelle, if you are looking for more ideas! Hopefully, now that you're at the end of this post, you feel that you have a toolbox of no-prep games and activities that you can use to warm up your students before guided reading. There is nothing better than an arsenal of activities you can easily add to your routine, but that don't require any extra prep - #amirite?? 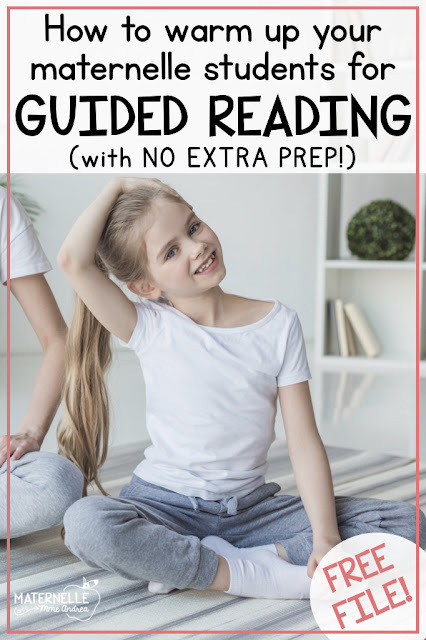 But, I don't want you to end up sitting at a nice table of students staring expectantly at you after your warm-up is over, either, so if you need more info on what to do next with your kiddos, I have a blog post all about guided reading, with my best tips and an outline of the reading strategies that I teach. You can also check out this blog post, which outlines the rest of my guided reading block, after the warm-up. I have changed my routine up a bit since I wrote that post, substituting some guided writing for the post-reading game, but it will give you an idea of some things you could do. I also have a complete French guided reading pack for maternelle in my TPT store, that will really help you on your way if you aren't sure where to start! Need some help with Lecture guidée? 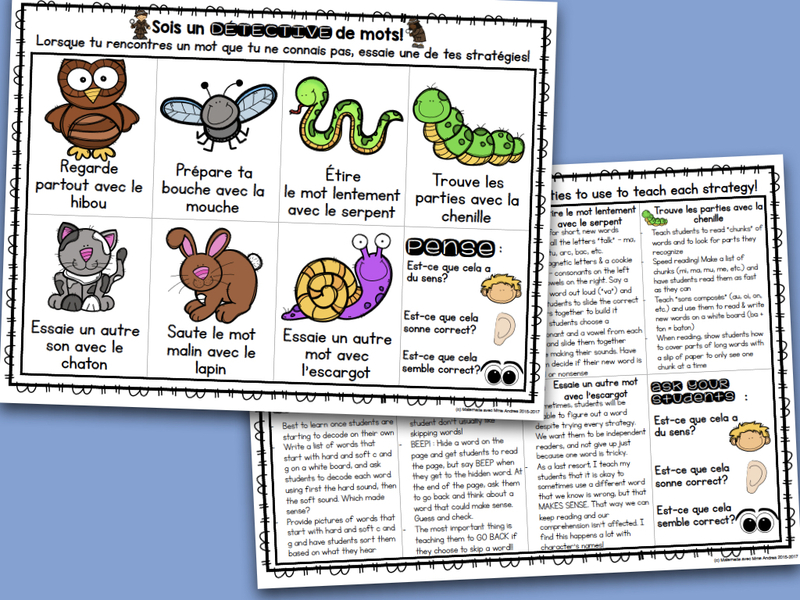 Sign up to receive a FREE guided reading strategies poster & cheat sheet, and start helping your French primary students become independent readers!